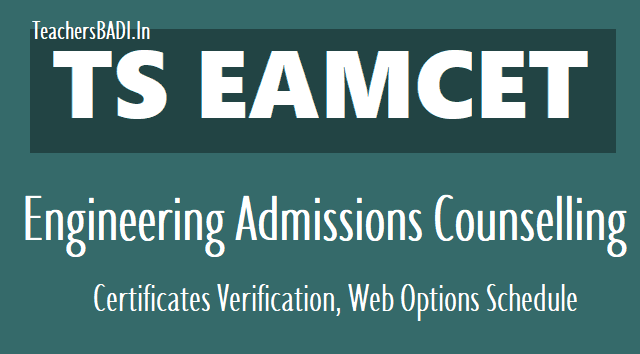 TS EAMCET Engineering Counselling Schedule, TS EAMCET Engineering admissions Counselling, Certificates Verification, Web Option Dates 2019, TS EAMCET MPC Stream admissions Counselling, Certificates Verification Web Options Dates 2019: Results of the Telangana State Engineering, Agriculture and Medical Common Entrance Test-2019 (EAMCET-2019) has been released. Results are available on the website https://eamcet.tsche.ac.in. The EAMCET was conducted by Jawaharlal Nehru Technological University (JNTU Hyderabad) from May 2 to May 7. Through this exam, admission will be provided into BE, BTech/BTech (Bio-Tech)/BTech (diary technology)/BTech (Ag. engineering)/BPharmacy/BTech (food technology (FT))/BSc (Hons) agriculture/BSc (Hons) horticulture/BSc (forestry)/BVSc and AH/BFSc and Pharm-D. The Qualified candidates of TS EAMCET 2019 desirous of seeking Admission into B.E /B.Tech /Pharmacy are informed that the admissions counselling will commence on ..-05-2019. Minority candidates who have not qualified or not appeared in TSEAMCET 2019, but passed and secured required percentage of marks in qualifying examination can also attend for counselling to consider them for admission into minority colleges in leftover vacancies. For details notification visit the official website on ...-05-2019. Engineering admissions will be completed by June-end: Telangana State Council for Higher Education (TSCHE) Chairman T Papi Reddy stated that admission process into engineering colleges would be completed by June-end and classes for first year students would commence from July. There were 222 engineering colleges in last year. The number of colleges may come down to 200 this year.